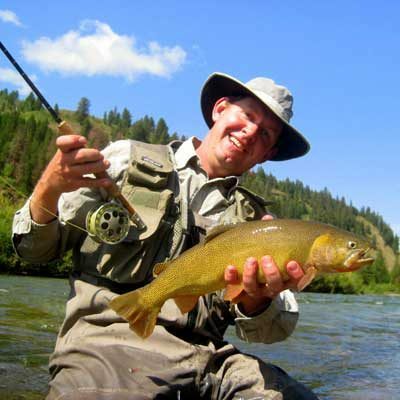 Exclusive Private Access Wade Fishing - Two Rivers Fishing Co.
Two Rivers Fishing Company offers the best private access wade fishing in the area. Our private leases provide ample opportunity to test your skills on feisty Rainbow, Brown, Brook and Cutthroat trout. 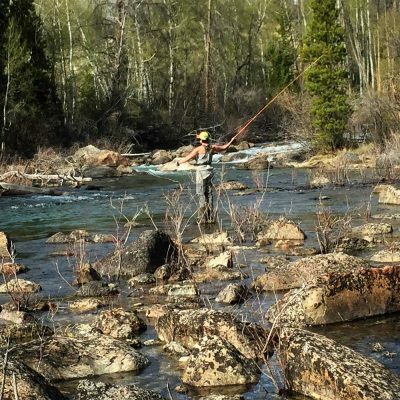 These leases, located on private working ranches, allow the fishers to leisurely roam miles of prime trout stream in total solitude, which for many is an integral part of the fly fishing experience. We rest and rotate beats on these waterways to ensure the fish stay fresh. Stalking trout in these secluded venues is an incredible and memorable experience. Walk-wade trips on public stretches of water are also available, for either a full- or a half-day. Our half-day wade trips are a great way to get your feet wet, so to speak, and allow anglers to plan their trip around the best fishing times: morning or afternoon, depending on the season. Half-day wade trips are ideal for those who don’t have a full day to play but still want an exceptional fishing experience. Half-day wade trips are for one or two rods, so grab a friend and hit the river! Half-day wade trips last approximately four hours. Our full-day wade trips are a great way to put on some waders and spend the day exploring western Wyoming’s world-class trout rivers. Getting up close and personal with the water while surrounded by incredible scenery offers a more customizable fishing experience, with the freedom to move up and down the banks and fish where you want. Full-day wade trips accommodate one or two rods and generally last approximately eight hours. Private. Access. Need we say more? 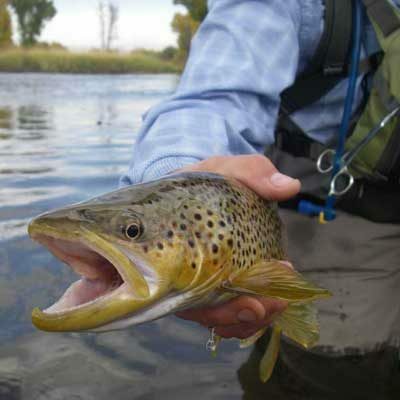 Our private lease accesses open up a different world of wade-fishing Wyoming’s trout streams. Guides provide flies, lunch, beverages and snacks. These trips are ideal for experienced anglers looking for complete solitude and incredible fishing. Private beats are used in rotation to keep the fish feisty. Just like we like ’em. This spring creek-like stream, which meanders through a private ranch on the outskirts of Pinedale, produces some phenomenal trout fishing. Throughout the season, large trout can be seen holding in a variety of water features including runs, deep holes, under cut banks and within weed troughs. The large Rainbow and wily Brown trout will take surface and subsurface flies with equal zeal if they are presented well. The hatches are great and sight-casting for big trout is the ultimate challenge. This stream is ideal for experienced anglers and will reward those who are patient and technically proficient. We limit the number of rods on this lease so we can give each angler who visits the best fishing opportunity possible. This is a wonderful freestone stream which holds the Fine Spotted (Snake River) Cutthroat trout. It is located on the very scenic Jackson Fork Ranch and offers over six miles of fishable private water. In addition to day-fishing trips offered by Two Rivers Fishing Company, you can stay on this beautiful property by arranging an overnight (or two) at The Lodge at Jackson Fork Ranch. Winding through beautiful private ranches these small streams offer excellent Cutthroat and Rainbow trout fishing. Willow-lined banks and protective undercuts provide ideal fish habitats for native Colorado River Cutthroat. A day on these streams will find you surrounded by nothing but magnificent scenery and hungry trout. It will certainly be a day to remember.